Comic 38 - "The Decision"
ok I really want to know how you got the voting thing to work ..
That's one of Joey's tub songs (later in the story). But of course she has her own lyrics. ...but I haven't got those options yet. I probably can in the future. You've been playing too much Mad Max which one has the built in variable speed vibrators? She heals fast and gets dressed even faster. 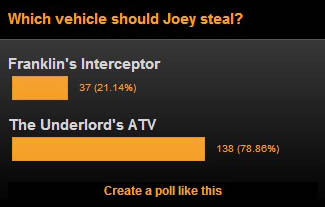 Yeah I think the ATV is running away with the vote. But it's still early yet.